Symptoms are similar to Pseudomonas and Mummyberry. Look for the gray sporulation. Infected blossoms take on a brown, water-soaked appearance and die. 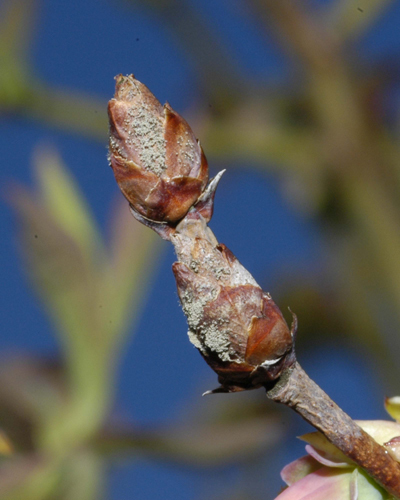 Blossoms may be covered with dense grayish powdery masses of Botrytis spores. Sporulation of Botrytis can be seen on this blighted shoot tip. Botrytis rot of green fruit. Note the floral tissue still attached to the berry. More green fruit rot due to Botrytis. OSU Plant Clinic Image, 2016. The disease also can move from blossoms back into fruit-producing wood. Stem lesions on this 'Legacy' blueberry. Cause Botrytis cinerea, a fungus that survives as sclerotia (resistant survival structure) and dormant mycelia on dead twigs of bushes and prunings. It also overwinters as a saprophyte on dead organic matter and dead plant parts in or on the soil surface. Many different fruit and ornamental crops (such as blackberry, raspberry, and strawberry) are susceptible to infection and may be sources of spores. 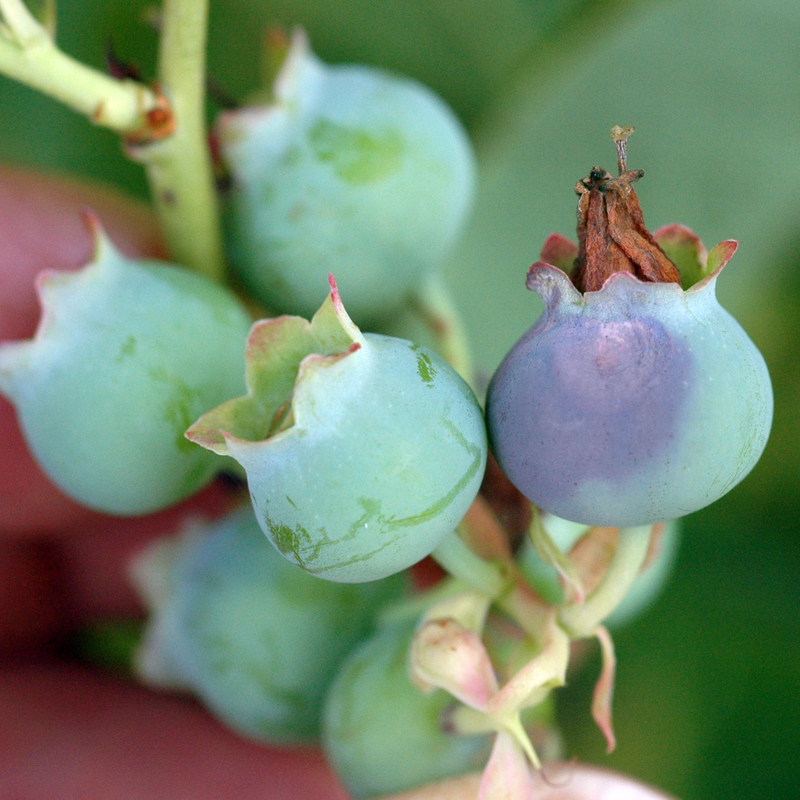 Blueberry fields in Florida that were within 50 feet of strawberry fields had a higher incidence of Botrytis diseases. A related species Botytis pseudocinerea, has been reported from a low number of rotted fruit in California. This species is naturally resistant to the fungicide fenhixamide. In spring, these tissues produce vast numbers of spores during wet periods. Spores spread primarily by wind but also by splashing water. Susceptibility is highest during bloom and again near harvest. Cultivars that tend to retain floral structures over a long period are more susceptible. Green fruit can rot when rains continue into the late spring and early summer. Infection is more likely on fruit that retains old floral tissue (which is varietal dependent and increases with higher humidity). Also, branch tips killed by low winter temperatures are easily infected. 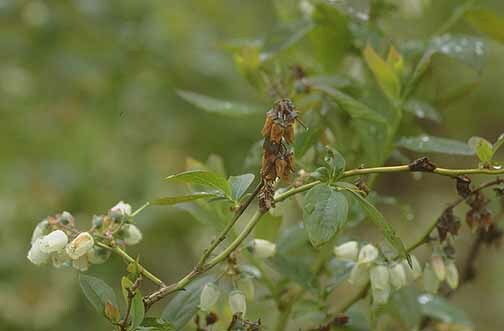 Symptoms During wet springs, blueberry blossoms take on a brown, water-soaked appearance and die. 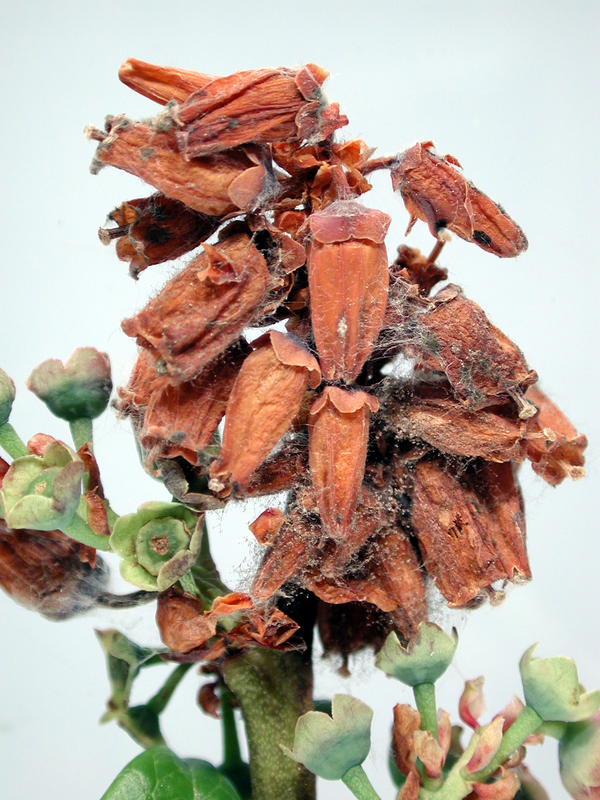 Blossoms may be covered with dense grayish powdery masses of Botrytis spores. Infections may move through the blossoms rapidly and often destroy the entire floral structure. The disease also can move from blossoms back into fruit-producing wood. On young leaves, pale brown lesions form. 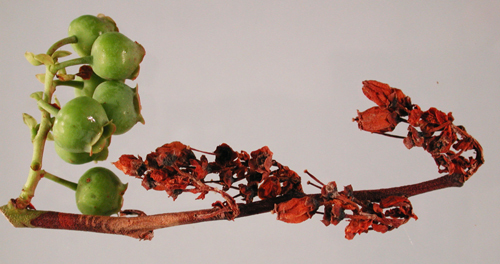 Green fruit rot starts as a brown water-soaked discoloration near the calyx end of the fruit. Brown necrosis spreads such that whole sectors of the berry are involved. The entire berry rots and shrivels, then falls off the cluster. 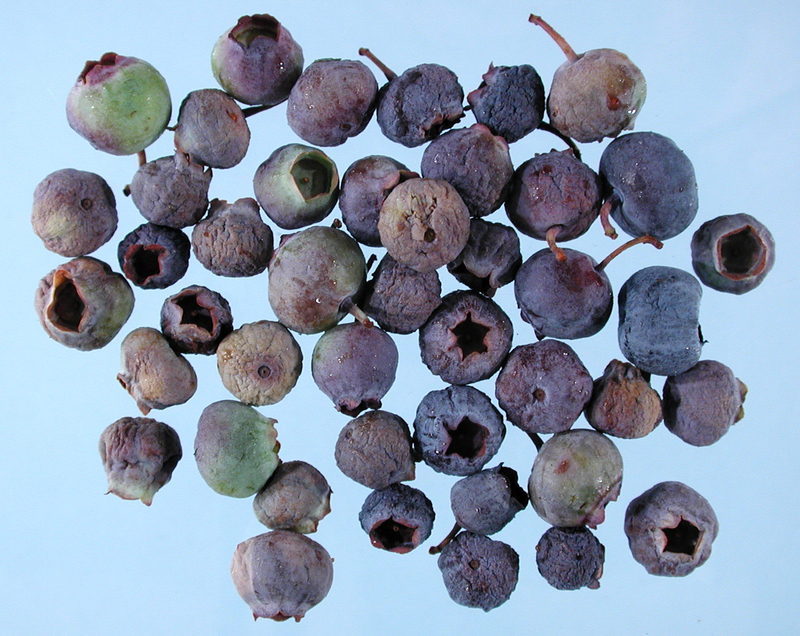 Fruit may also shrivel and be covered with the characteristic gray sporulation after harvest. Infected succulent twigs are at first brown to black and later bleach to tan or gray. Twigs blight from the tip toward the base. Black sclerotia can be found near the tip of blighted twigs. 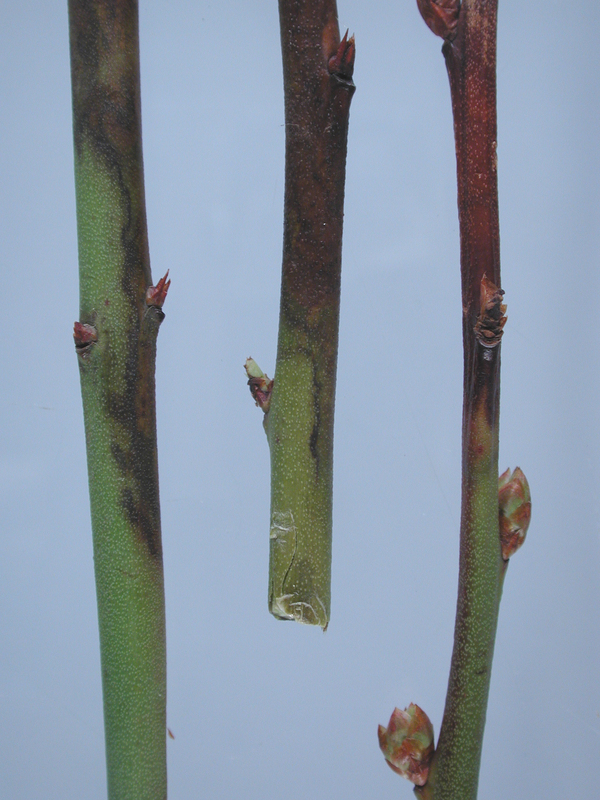 Symptoms can be seen after winter injury and/or before floral budbreak. The disease is easily confused with bacterial blight and/or the shoot blight stage of mummy berry if there is no sporulation. Annually prune to remove infected twigs and to open canopy for good air circulation. Space plants for good air circulation and quick drying. Adjust timing and/or frequency of overhead irrigation to keep aboveground portions of the plant dry. Use drip irrigation. Pick fruit at correct stage of maturity and move harvested fruit to cold storage as soon as possible. Chemical control Apply fungicide from prebloom through the end of bloom. A preharvest application is useful to control fruit rot after harvest. Alternate or tank-mix materials from different groups with different modes of action to avoid problems with resistant strains. Minimize the use of any one group during the growing season. Strains resistant to several different modes of action have been reported from throughout the world including PNW. Surveys in Oregon from 2014 to 2017 have found Botrytis resistant to fungicide groups 7, 9, and 17. Captan 80 WDG at 1.25 to 3 lb/A. May be applied up to day of harvest. Moderately effective alone. Group M4 fungicide. 48-hr reentry. CaptEvate 68 WDG at 3.5 to 4.7 lb/A. Can be used day of harvest. Group 17 + M4 fungicide. 48-hr reentry. Elevate 50 WDG at 1.5 lb/A. Can be used up to and including the day of harvest. Group 17 fungicide. 12-hr reentry. Iprodione 4L AG at 1.5 to 2 pint/A plus another fungicide with a different mode of activity. Can be applied up to and on the day of harvest. Group 2 fungicide. 24-hr reentry. Kenja 400 SC at 13.5 to 15.5 fl oz/A. Do not use within 7 days of harvest. Group 7 fungicide. 12-hr reentry. Luna Tranquility at 16 to 27 fl oz/A. May be used day of harvest. Group 7 + 9 fungicide. 12-hr reentry. Meteor at 1.5 to 2 pints/A plus another fungicide with a different mode of activity. Can apply the day of harvest. Group 2 fungicide. 24-hr reentry. Omega 500 F at 1.25 pint/A. Do not use with an adjuvant or within 30 days of harvest. Group 29 fungicide. 12-hr reentry. Oso SC at 3.75 to 13 fl oz/A. May be applied on the day of harvest. Group 19 fungicide. 4-hr reentry. Ph-D WDG at 6.2 oz/A plus an adjuvant. May be applied on the day of harvest. Group 19 fungicide. 4-hr reentry. Pristine at 18.5 to 23 oz/A. Do not use with any other tank additive except Captan. Can be used day of harvest. Do not use if already used for mummy berry management. Group 7 + 11 fungicide. 12-hr reentry. Switch 62.5 WG at 11 to 14 oz/A. May be used up to and including the day of harvest. Group 9 + 12 fungicide. 12-hr reentry. Vacciplant at 14 to 22 fl oz/A. Can be used day of harvest. Unknown efficacy in the PNW. Group P4 fungicide. 4-hr reentry. Ziram 76 DF at 3 lb/A. Do not apply after 3 weeks from full bloom. Moderate to poor control ranking. Group M3 fungicide. 48-hr reentry. 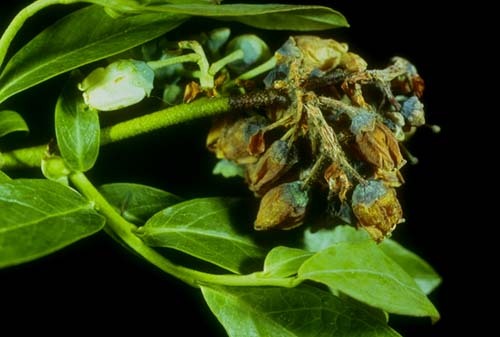 Notes Use of products that contain propiconazole (Tilt or Bumper) for mummy berry management has been associated with an increase in Botrytis severity. Use of products such as Bravo Weather Stik have been suggested for use during early bloom to manage fungi resistant to other products. Use during bloom may result in fruit russeting of some cultivars. Regalia is not recommended during bloom due to variable efficacy in western Oregon and fruit russet associated with high rates during bloom. References Saito, S., Michailides, T. and Xiao, C.L. 2016. Fungicide Resistance Profiling in Botrytis cinerea Populations from Blueberries in California and Washington and Their Impact on Control of Gray Mold. Plant Disease 100:2087-2093. Amiri, A., Zuniga, A.I., and Peres, N.A., 2018. Potential Impact of Populations Drift on Botrytis Occurrence and Resistance to Multi-and Single-Site Fungicides in Florida Southern Highbush Blueberry Fields. Plant disease 102:2142-2148.